Upon arrival at Rome airport, meet our Iscra Representative. Transfer to the hotel. Check-in at the hotel according to the flight arrival time. Later proceed to City centre for guided Rome City tour. Visit all famous leisure sights of Rome such as Coliseum, Trevi Fountain, Pantheon, Roman Forum etc. In the evening enjoy Indian or local dinner. Overnight in Rome. After breakfast proceed to Vatican to attend Papal blessings (Only on Wednesday)/ Later enjoy Indian lunch and get ready for Guided Vatican City tour with entrance to Vatican Museums (including visit to the Sistine Chapel). Evening Indian dinner. Overnight in Rome. Morning enjoy guided Rome city tour, visit all famous religious sights of Rome city, later proceed to Assisi. Enjoy local lunch on the way to Assisi. 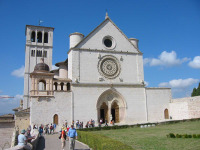 Upon arrival to Assisi meet English speaking guide and visit all famous sights of Assisi. Later proceed to Pisa. Upon arrival to Pisa, check in at the hotel. Local Dinner & Overnight. Morning visit to the Leaning tower of Pisa with English speaking guide. Later proceed to Padova. Enjoy Indian lunch in Padova. After lunch guided visit of Padova. Visit famous St Antonio basilica. If time permits celebrate Mass with pre reservation. Evening Indian Dinner & Overnight in Padova. In the morning proceed to Venice Tronchetto and transfer by ferry boat to Venice Island. Enjoy guided City tour of Beautiful Venice for 2 hours. Visit St Mark's Basilica, St Mark's Square and other important places including Murano Glass Showroom. Return by ferry boat to Venice Tronchetto. Enjoy Indian lunch in Venice Mestre and proceed toward Switzerland. Upon arrival to Engelberg, check-in at the hotel, dinner & overnight. Enjoy 6 hrs excursions to Mt Titlis with Ice Flyer and enjoy Indian Lunch on the top of the Mountain. Afternoon travel to Lucerne for Guided Visit, visit famous places like Lions Monuments, Old Bridge and some free time for shopping near Lake Lucerne. Evening return back to Engelberg. Dinner & Overnight. After breakfast proceed to Paris, you will pass through the beautiful countryside of France, enjoy local lunch at Dijon. Evening upon arrival to Paris - enjoy local or Indian dinner. Check-in in Paris. Overnight in Paris. Today enjoy full day guided Paris city tour with our expert English speaking guide. First you will visit the Eiffel Tower 3rd level, later enjoy local lunch. After guided city tour of Paris. Visit all possible leisure & religious sights of Paris such as Notre Dam Cathedral, The Opera, Sacre Coeur, Miraculous Medal. Evening Indian Dinner & Overnight. After breakfast get ready to a long drive to Lourdes. Enjoy lunch in between. Upon arrival to Lourdes check-in at the hotel. Dinner & Overnight. Morning free for personal religious activity, at around 10:00 AM enjoy guided Lourdes city tour for 3 hours. Our guide will take you to all religious sights of Lourdes city. In the afternoon enjoy a local lunch at the hotel. Rest of the day free on your own. Book your mass with pre reservation. Evening Dinner & Get ready for candle Light procession. Overnight. In the morning proceed to Salamanca (Spain). Enjoy Lunch in between. Upon arrival to Salamanca, if time permits visit the city on your own. Later check-in at the hotel, dinner & overnight in Salamanca. After breakfast proceed to Fatima (Portugal). Check in at the hotel. Enjoy lunch at the hotel in Fatima. Later meet English speaking guide and visit all religious sights of Fatima. Evening Dinner & Candle light procession. Overnight in Fatima. Morning Proceed to Madrid. Enjoy Lunch in between. Upon arrival to Madrid 2 hrs Guided Orientation city tour. Evening check in at the hotel. Dinner & Overnight. After breakfast proceed to Madrid airport. End of services.